Main motor is made by Siemens. Adopts combined pneumatic friction clutch and brake. Six-face rectangle lengthen guide; JH21-315B/400B adopts eight-face lengthen guideway. JH21-25/25B/45 adopts manual shut height adjustment,among these types JH21-25/45 adopts scale display and JH21-25B with digital display.JH21-63 and above type adopts electric shut height adjustment with digital display. JH21-45 can equip with die set height adjustment motor, the value will be displayed by digital. 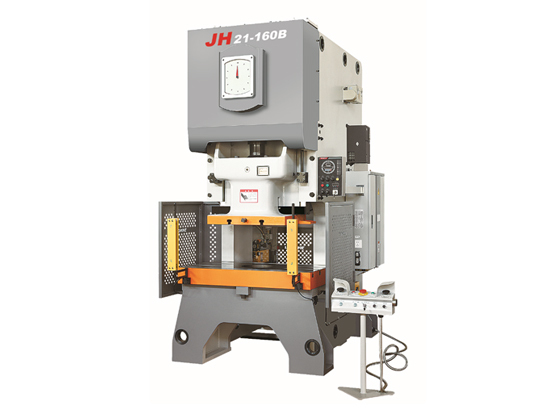 JH21-25B, JH21-45 and above type equipped with balance cylinder. Electric compelling grease lubrication system. One set of blowing device. Controlled by PLC with international brand. Buttons, indicators, AC contactors, air circuit breakers and other controlling devices are imported from international brand. Equipped with optional air cushion device, automatic feed shaft and photoelectric protector,which can used to work with various automatic equipments.